SAINT PETERSBURG Vending Machine Companies! 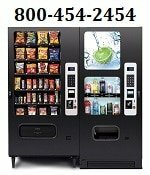 Offering Free Vending Machines: Snack, Soda, Coffee, Deli, Food, Frozen, Healthy vending, Micro Markets, Amusement Games and repair services for your employee breakrooms! Please contact these vending service companies direct for more information about their products and services. Gilly Vending excels at providing award winning state-of-the-art custom vending concepts, micro-markets, healthy vending, coffee, and water stations to prestigious hospitals & GPO’s, airports, military bases, transportation hubs, colleges & universities in coast-to-coast. Gilly is a M/WBE & ACDBE certified company providing exemplary vending and food service throughout the USA. Smart Box Company – Vending Refreshement Services – Better Smarter Choices, Anytime, Anywhere. Access 100’s of fresh foods, snacks, and beverages where you work, learn and spend most of your time. Snack Box Company is based in Jacksonville, servicing Southern Florida.